Above: MP Harriet Harman, at left, welcomes Poverty2Solutions in her office. 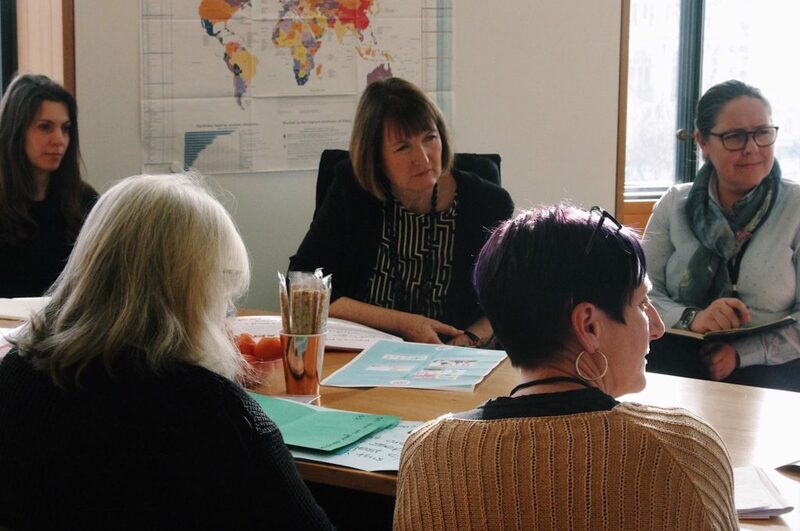 “What do you think I need to hear?” It is with these words that Harriet Harman MP welcomed ten activists from Poverty2Solutions who have direct experience of living in poverty. When the delegates were welcomed in her bright office at Portcullis House on 5th March 2019, any apprehension that might have paralysed them was very rapidly washed away by Ms. Harman’s accessible personality. Poverty2Solutions had requested the meeting in order to make a specific policy request of the minister: to call on the UK Government — and the Labour opposition — to commit to the implementation of a socio-economic duty. This policy came into force in Scotland in April 2018 as Fairer Scotland Duty. In the rest of the United Kingdom, this policy would mean that key public bodies like councils and the NHS would have to consider what more they can do to reduce poverty and inequality when they make major decisions. Most of the worries expressed at the time remain of concern today. This time Poverty2Solutions set the agenda. The main topic of discussion was their request for a socio-economic duty measure that would ensure that public sector bodies consider how they can reduce socio-economic disadvantage when making important decisions. 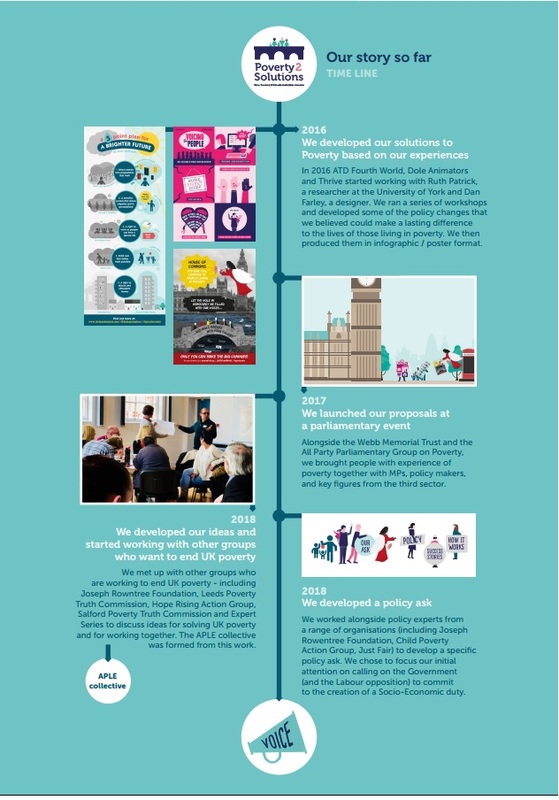 In addition to the Fairer Scotland Duty, Poverty2Solutions was inspired and encouraged by the Localising Social Rights proposal led by Just Fair. Poverty2Solutions directed their request to Ms Harman because in 2010, when she was minister for women and equalities, she introduced a similar measure as part of the Equality Act 2010. However, when the Conservatives and Liberal Democrats came into power, this part of the act was dismissed by then Home Secretary Theresa May. After Poverty2Solutions was introduced, Colin (Thrive Teesside) initiated the dialogue by asking: “What motivated you to back the duty at the time [in 2010]?” Ms Harman answered that it came from her desire to combat unfairness of any kind. People recognise discrimination based on gender, ethnicity, faith, etc., but rarely consider that one of the greatest unfairnesses is whether you have money or not. Ms Harman too believes it is necessary to have the voices and experiences of people living in poverty embedded into the policy-making process. In 2017, an early-day motion was voted for by 82 MPs, none of whom were Conservatives. Ms Harman said she trusts that some Conservative MPs would be ready to support it now and committed herself to reboot the motion. Today, there is a wider recognition that poverty must be tackled with people with direct experience. Politicians realise the increase in food banks use wasn’t just a blip, it is generalised. “I think some things got better since; and then got worse again,” Ms Harman said. There is a more widespread recognition of the expertise of lived experience and a need for the duty to embed lived experience into policy-making. The discussion was now in full swing and Ms Harman was really enthusiastic and motivated about giving her full support. But the clock was ticking and Ms Harman had to conclude the meeting. She said her next steps would be to have another look at an early-day motion, to look at names of people who could back it, to contact and seek commitment from local MPs, and to stay in contact with Poverty2Solutions. Acknowledging and addressing people’s personal circumstances, Ms Harman emphasised the importance of listening to people with lived experience when shaping policies that have an impact on their lives. Ms Harman left a very positive impression on her guests. Patricia (ATD Fourth World) says: “We were made to feel very welcome, especially as we were invited actually into her office. The meeting didn’t feel rushed. She took her time with us listening to us and really hearing what we had to say.” Not everyone could ask the questions they had prepared in advance, but they left them with Ms Harman. “Whatever we told her, I hope she will be true to her word and do what she said she would do,” Angela concluded. Developing the confidence to be able to talk in public is an ongoing process that takes time and a lot of work. When all your life you’ve been scorned and decisions have been imposed on you, the idea of expressing your own opinions can be daunting. Preparation is key to achieving this — and was essential to meeting with Harriet Harman. “Having written my piece on paper made it easier for me. I was less nervous,” said Angela. Seamus added: “The preparation time was very good. It was good to prepare in advance. I didn’t know what to expect. I didn’t know what it would be like be to meet with Harriet Harman. But it went very well.” Equally essential was the peer support. Poverty2Solutions prepared the meeting with Ms Harman as a group, creating a feeling of solidarity and shared ownership among the participants. This was achieved not only through productive teamwork, but also through sharing a meal together or rehearsing in the relaxed atmosphere of a café. To see the meeting request from Poverty2Solutions: click here or to read about its campaign strategy: click here. (To enlarge click on the image).